Part 4: Cloud Computing – A Complex Ecosystem? Here is a quick highlight of the Appirio matrix. You’ll need to view in “full-screen” mode (“FS”). I believe Troy Angrignon assisted in the creation of this, and contributes to the updates. Part 3: Cloud Computing – A Complex Ecosystem? 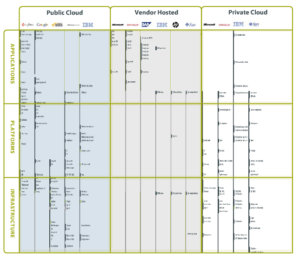 Part 2: Cloud Computing – A Complex Ecosystem? Part 1: Cloud Computing – A Complex Ecosystem? Hi Jim, love the gallery! As you have seen, it’s nearly impossible to represent this much data without trying all sorts of visual tricks. We’re continuing to add companies to it and I’m also working on a fifth version which will likely be released mid 2010.